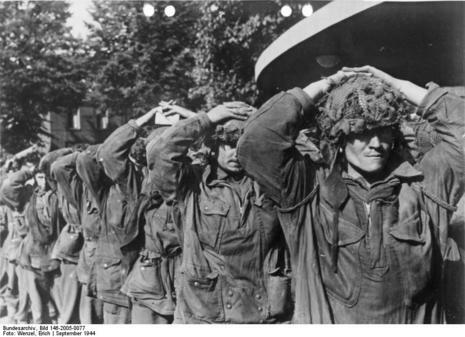 With the arrival of the South Staffords and 11th Parachute battalion at the 1st and 3rd Parachute Battalion's positions west of Arnhem, the British hoped to have sufficient troops to break through to Frost's position at the bridge. Lieutenant Colonel Dobie of 1st Parachute Battalion planned to attack before first light but an erroneous report suggesting that the bridge had fallen led to the attack being cancelled. By the time the report was corrected first light was not long away but with reinforcement at the bridge the priority, the attack had to proceed. The advance began on a narrow front with the 1st Parachute Battalion leading, supported by remnants of the 3rd Parachute Battalion, with the 2nd South Staffordshires on the left flank and the 11th Parachute Battalion following behind. As soon as it became light the 1st Parachute Battalion was spotted and halted by fire from the main German defensive line. Trapped in open ground and under heavy fire from three sides, the 1st Parachute Battalion disintegrated and what remained of the 3rd Parachute Battalion fell back. The 2nd South Staffordshires were similarly cut off and save for about 150 men, overcome by midday. The 11th Parachute Battalion, which had thus far not been heavily involved, was now overwhelmed in exposed positions while attempting to capture high ground to the north. The South Staffords similarly attempted to secure high ground but were driven off. With no hope of breaking through, the 500 remaining men of these four battalions retreated westwards in the direction of the main force, 5 km (3.1 mi) away in Oosterbeek. 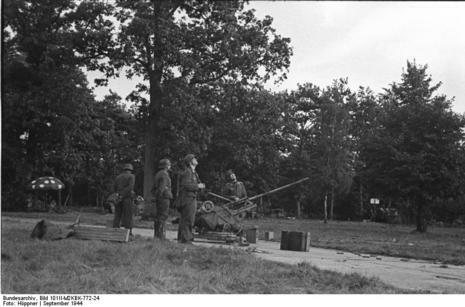 As they approached Oosterbeek they were met by Lieutenant Colonel Sheriff Thompson, of the 1st Airlanding Light Artillery Regiment, who formed most of the men into a defensive screen under Major Robert Cain half a mile forward of his artillery positions. The battle gave Urquhart the opportunity to escape his position and he was able to return to Division HQ at the Hotel Hartenstein in Oosterbeek, where for the first time he was able to learn the extent of the German forces facing them.